MANILA, Philippines - Signal No. 2 were raised by PAG-ASA in 15 areas and Signal No. 1 in 16 areas in its latest weather update on 'Bagyong Vinta' issued at 8:00 A.M., Friday, December 22, 2017. 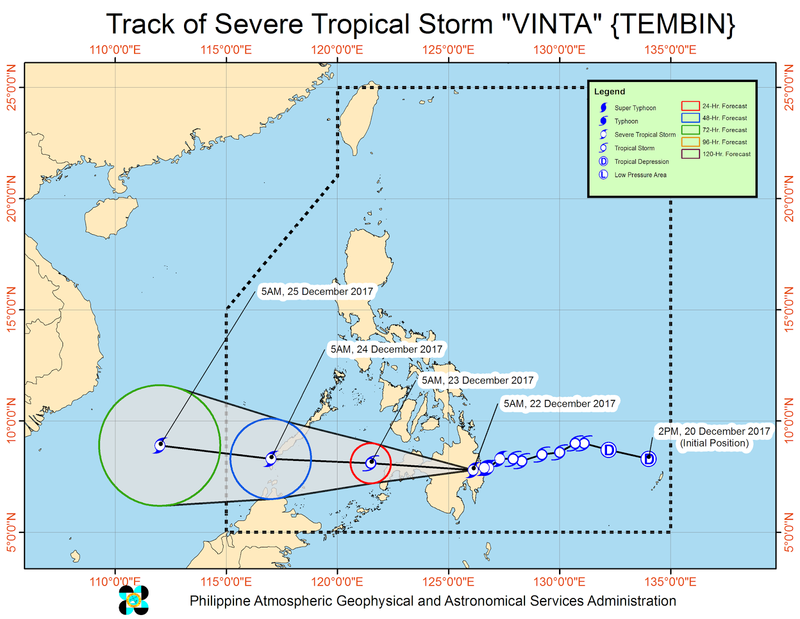 At 7:00 AM today, the center of Severe Tropical Storm "VINTA" was estimated based on all available data including Hinatuan Doppler Radar at the vicinity of Laak, Compostela Valley (07.9 °N, 125.7 °E) As of this posting, the severe tropical storm is now traversing Compostella Valley. Maximum sustained winds of 90 kph near the center and gustiness of up to 155 kph are expected. The severe tropical storm is forecasted to move West at 20 kph. Below is the forecast movement and track of the 'Vinta' in the next 24h, 48h and 72h courtesy of PAGASA. Meanwhile, PAG-ASA will release the next weather bulletin at 11:00 AM today, December 22, 2017.